From her own fashion line to lipgloss to footwear, Kylie Jenner has a knack for turning whatever she touches into gold… or at least a lot of posts on social media. It’s no different for the PUMA Fierce, our new women’s training shoe that hit shelves instore and online on Friday, 1st April, and which Kylie models in our Spring/Summer campaign. Hot on the heels of the release of the Fenty PUMA by Rihanna Trainer, the PUMA Fierce was eagerly awaited by the online community ever since the sneak peak of the women’s training campaign shoot that Kylie shared on Snapchat. The 18-year-old headlines the campaign along with other PUMA ambassadors, focusing on our new fitness footwear style. “Not only are they pretty slick, but history shows it’s the kicks that reach fever pitch quickest. If one item is destined to sell out from the Jenner-fronted collections, it’s those babies,” Glamour.com’s Leah Melby predicts. The PUMA Fierce is a lightweight laceless training shoe designed to offer performance during training as well as street-worthy styling and is available in white, black grey or red. In the latest image to be released, Kylie Jenner wears the white version with heritage crew socks and a short- and jacket-ensemble over a sports bra. In the first campaign images, she models the black pair with our Active Training All Eyes on Me three-quarter length sports tights. 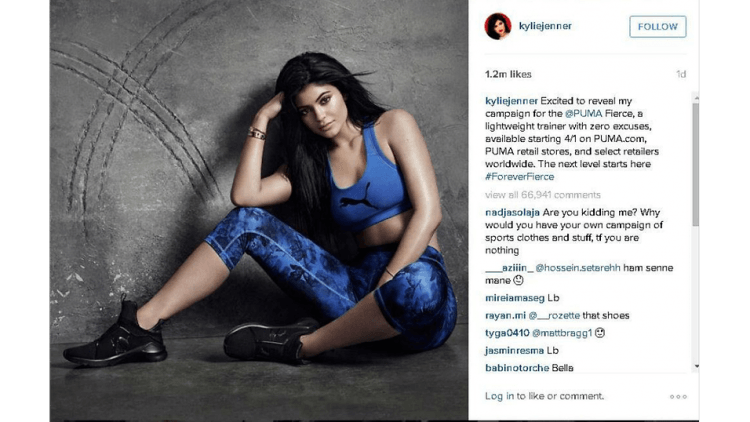 Check puma.com and the hashtag #FOREVERFIERCE for how Kylie and others style the shoe. What is it you want to experience this year?